Fordex® marine grade safety flooring has a durable, attractive surface consisting of numerous diamond shaped nodules that are further abraded on the top surface. This design improves grip even in the most challenging conditions. The surface nodules channel water away reducing unsightly & dangerous water ponding which can be the major cause of aquaplaning. Fordex® safety flooring is designed to provide a secure nonslip surface in areas where grip under foot is paramount to pedestrian safety. A combination of specialized polymers and surface profile design delivers a high co-efficiency of friction in both wet & dry conditions. The resulting flooring surface meets the Australian Standards AS4586 and the Building Code of Australia (BCA). Fordex® is a cost effective way of eliminating the risk of slips, trips and falls, particularly on ramps leading in and out of buildings. When it comes to pedestrian anti-slip requirements and public safety, it may be prudent not to rely on surfaces which are inconsistent and produced in-situ by installers with little or no training and surface treatments which wear away over time. Optimum resistance to wear & chemicals typical to the marine industry such as fuel, grease, chlorine and salt. 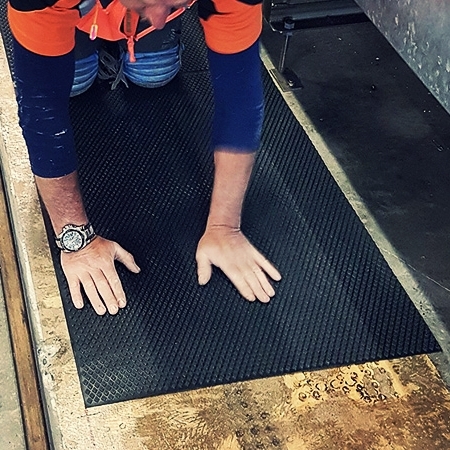 Appropriate for all anti-slip safety applications such as walkways, stairways, external ramps and pontoons, marine decking, swimming pool surrounds, house boats and most other excessively wet areas. Available in 4 attractive colours to meet the aesthetic requirements of most internal/external applications: Grey, Black, Ocean Blue and Safety Yellow Custom colours are available upon request subject to quantity.